This week, our Fresh Choice Nelson guest blogger, Paula, has some recipe inspiration for all you nut-free peeps out there. 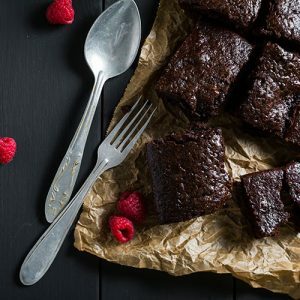 She has a delicious recipe for nut-free low carb brownie. Take it away Paula! A lot of my low carb, sugar-free baking is made with nut flours and desiccated coconut. But, there are many people who are allergic to nuts or don’t like coconut. With that in mind, I have a really simple recipe for a flourless, nut free, low carb brownie. It is gluten free, grain free and sugar-free. I use a blend of stevia and erythritol available as Sweetnz classic blend. You can find it on the shelf in the baking aisle at Fresh Choice, Nelson. I’ve discovered this cake ticks lots of boxes! 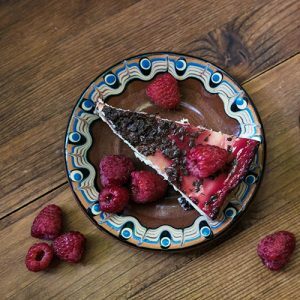 With the addition of raspberries, it has a nice tart bite which cuts through the richness of the cake. Serve it with some Greek yoghurt or whipped cream. We are lucky enough to still have fresh summer berries in the produce department, even though summer is officially over. If you, like me, are watching your carb intake, you will be pleased to know it comes in at just 2g carbs per slice. Blend all the ingredients, except for the raspberries, with a stick blender. Once smooth stir through the raspberries. Pour into a lined baking dish and bake at 180 degrees for 20 to 25 minutes. Cool and place in the fridge. Get baking this weekend. A good batch will give you sweet treats for a week! Don’t forget to call into Fresh Choice Nelson for all your ingredients. 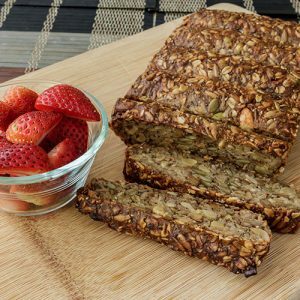 This week, our Fresh Choice Nelson guest blogger, Paula, has a low carb loaf recipe for you to try at home. Take it away Paula! I have embraced a low carb diet way of eating since the start of this year. This includes no wheat, grains or sugar, so I have naturally started to adopt a gluten free diet. Most people love bread, and I am no exception. I am often asked for a low carb loaf alternative. There are plenty of recipes out there, but I have created this one, it has taken a few tweaks to get it just right. I am so happy with the result. So, I decided to share the recipe with you. All the ingredients can be found at Fresh Choice Nelson. They also stock a fabulous range of low carb crackers and other goodies to stock up on. My nutand seed bread is best served toasted. My favourite toppings for this low carb loaf are Pic’s peanut butter or poached eggs. Try smashed avovado taken to a new level by adding some crumbled feta, cherry tomatoes, basil and a good splash of olive oil. Mix together the wet ingredients then add to the dry. Place in a loaf tin and sprinkle with extra sesame seeds. Bake at 180 degrees for approximately one hour. Test by inserting a skewer, it should come out clean. Head to Fresh Choice Nelson for all your low carb loaf ingredients and don’t forget to pop your favourite toppings in your basket too! This week, our Fresh Choice Nelson guest blogger, Paula, is enjoying the spring produce on the shelves at Fresh Choice Nelson. She has a delicious salad recipe, perfect for lunch al fresco. Take it away Paula! Spring has definitely sprung! You may very well have noticed some spring produce making its way on to the shelves at Fresh Choice Nelson. Meals get lighter at this time of the year, and we start introducing more salads. Seasonal vegetables are such a treat for these. This salad showcases the most beloved spring ingredient, asparagus. It uses just a few ingredients, but they are incredible in flavour. Combined they create an incredible salad that I guarantee you won’t want to stop eating. 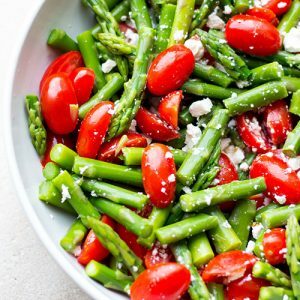 Make the most of spring produce with this Asparagus, Tomato and Feta Salad. Combine all of the ingredients in a suitably sized jar, and give it a good shake. Add the asparagus to boiling water and cook until just tender. Rinse in cold water and drain well. Transfer to a serving bowl with the tomatoes and walnuts. Drizzle your dressing over the top. Sprinkle with the Feta and enjoy! At Fresh Choice Nelson we think this delicious salad using spring produce has enough flavour to be served on its own for a light lunch. It’s also a delicious side salad with some grilled meat or fish. Our butchery has a full range of organic, gourmet, free range, corn fed, aged beef and wild game as well as your traditional favourites. We bring you fresh fish from Monday to Friday direct from the local Talley’s fishing boats. Arriving in store around midday. Going Carb-Free in Nelson? Discovered Konjac? If you’re going carb-free, then read on. This week, our Fresh Choice Nelson guest blogger, Paula, is writing about konjac, and the alternatives to rice and noodles. Plus there’s a bonus recipe. Take it away Paula! There is a great new product out, konjac. This has been used in Asian countries for many years. The konjac plant’s root can be ground to a flour and then made into ‘pasta’. Fresh Choice Nelson stocks the complete range from fettuccine to spaghetti noodles and konjac rice. The magic part is that these noodles are incredibly low calorie, carb-free, dairy free and gluten free. They are most definitely not a superfood, as they don’t contain much in the way of nutrition. But they are a great way to bulk up a nutritious meal, if you want to shed some excess weight, lower your carb intake, or if you follow a gluten or dairy free diet. I find the best way to serve them is to rinse and drain them really well. Then I pan fry them in a little butter or oil. They are precooked, so you really only need to heat them through. I like the spaghetti with Bolognese or Asian styled soups or stir-fry. The rice is great with curry and also made as fried rice. And the fettuccine is delicious with a creamy chicken and mushroom sauce. They can take a little getting used to, but konjac products are a firm carb-free favourite in my house. 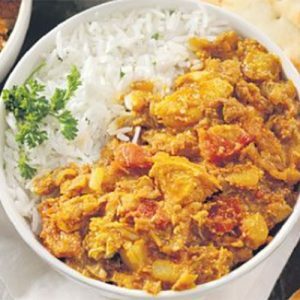 Try the curry recipe below with the konjac rice. Low carb, gluten-free and can be dairy free. 1 1/2 cups of cream, or if you prefer coconut cream. Heat oil in a frypan and fry the butter chicken paste, mustard seeds, turmeric and cumin for one minute. Then add the diced onion and diced chicken. Cook for about five minutes on high until the chicken browns slightly. Now add the can of tomatoes, cream, brocolli and spinach. Simmer for around ten to fifteen minutes. The cream should thicken slightly, and the curry becomes glossy. Serve with konjac rice. Head to Fresh Choice Nelson for your carb-free konjac products! 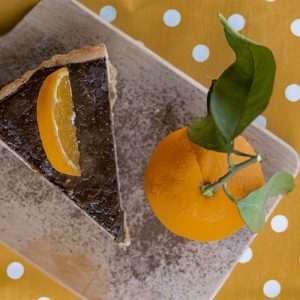 If you’re following a low carb eating plan, our Fresh Choice Nelson guest blogger, Paula, has a fabulous recipe for a sweet treat you’re going to love… Take it away Paula! There is a lot of interest at the moment in the benefits of combining low carb eating while adding healthy fats into our diets. These healthy fats include cold-pressed plant oils, salmon, high-quality dairy, nuts and seeds. Cutting down on processed grains and sugars is a great way to increase energy, lose excess weight, reduce cravings and balance blood sugar and insulin spikes throughout the day. 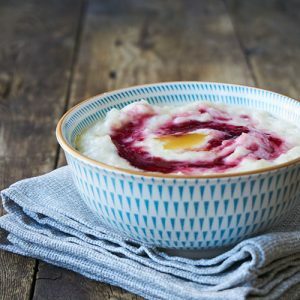 I have been following this low carb eating plan for most of the year and have found it beneficial to my wellbeing, not to mention a satisfying and delicious way to eat. Recently I created some new Inspire Meal Bag recipes, which are low in carbs, while rich in vegetables and healthy fats. Check them out in the produce department at Fresh Choice Nelson. The recipe cards on the front of the bags are labelled low carb and keto friendly. My favourite is the five spice beef on cauliflower puree. If you are following a low carb eating plan, this dessert recipe pairs well with all of the Inspire Meal Bags. Mix all the ingredients and place in a lined cheesecake tin. Press down firmly and bake at 180 degrees until lightly browned. Place all the ingredients into a blender and mix until smooth. Pour over the cooled base and return to the oven at 180 degrees until the filling is lightly firm. Bring to a simmer for five minutes. Cool and pour over the cooked vanilla layer. Set in the fridge. Once firm, pour over 200g of 90% chocolate melted with 1 tbsp of coconut oil. You can sprinkle the top with freeze-dried raspberries if you like! What are you waiting for? Head to Fresh Choice Nelson for all your ingredients! With the nights drawing in and temperatures cooling, it’s often tempting to entertain at home, rather than dine out. This week I’m sharing some recipes for Asian inspired dining that are perfect for when you are entertaining. The Inspire Meal Bag, Crumbed Tofu with Chilli Jam, may serve two, but it makes the perfect entree for four to six people. Follow it with the Beef Mussaman Curry or Chicken Pad Thai meal bags, which both serve four to six people. Remember, with the Inspire Meal Bags all the ingredients and your recipe card are put together in a handy bag, you can find them in the fresh produce department. Alternatively, shop for the ingredients, and follow the Asian inspired dining recipes below. I would finish your meal with a deliciously creamy coconut ice cream. Fresh choice Nelson has a fantastic range, you can jazz it up with toasted macadamia, thinly sliced kaffir lime leaves and crushed coconut cookies. Serves 2. Preparation time 10 minutes. Cooking time 10 minutes. Difficulty Level: Easy. For the chilli jam dice the onion and chilli and place in a saucepan with the brown sugar, white wine vinegar, fish sauce, water and 1 Tbsp of rice bran oil. Cook on a medium to low heat until the onion is very soft and the mixture has reduced and become sticky. Place in a small bowl and allow to cool. Cut the tofu through the middle and then into quarters, so you have eight pieces. Dip the tofu in beaten egg, then coat in the panko crumbs. Heat enough oil to cover the bottom of a frying pan over a medium heat. Cook for four minutes each side until golden brown and place on paper towels. Toss the chopped coriander, carrot and sliced spring onion with 1 tsp of the chilli jam mixed with the juice and zest of one lime. Serve the tofu with the rest of the chilli jam and the carrot salad. Sprinkle with crushed peanuts and enjoy. Serves 4. Preparation time 30 minutes. Cooking time 10 minutes. Difficulty Level: Medium. Place the first four ingredients in a saucepan and simmer until the onion and garlic are soft. Add the fish and soy sauce and simmer on a low heat for around twenty minutes, this is your Pad Thai sauce. 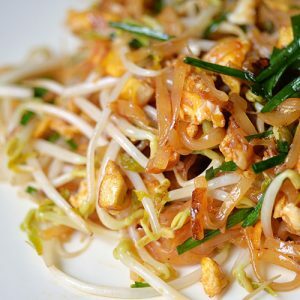 Heat the oil in a wok or pan, add the chicken and about 4 Tbsp of Pad Thai sauce. Cook until golden and cooked through. Remove from the pan and wipe it out, add more oil to cook the eggs, breaking up gently as they cook. Move the egg to the side of the pan and add the drained noodles and the remainder of the Pad Thai sauce and quarter of a cup of water. Cook the noodles until soft and browned. Add the meat back to the pan with the carrot, sprouts and coriander, toss together then serve. Sprinkle with crushed peanuts and a wedge of lime. Don’t forget to head to Fresh Choice Nelson to pick up all the ingredients for your asian inspired dining! Looking for meal ideas for a Nelson autumn? As autumn arrives in Nelson, you’re probably looking for meal ideas to warm the cockles of your heart… Well, we have good news! Paula’s back on the blog this week, and she has some inspiration for you! The change of season is upon us in Nelson, and the weather has definitely turned cooler. If you’re looking for meal ideas, you’ll be pleased to know that Inspire Meal Bags are changing too, with autumn and winter bags now in store.Each bag includes a recipe card and your ingredients. That makes deciding what to cook a whole lot easier. One thing I love at this time of year is warm comforting food, like hearty stews, warming curries, and, of course, soups! This recipe for Lamb Shank on Parsnip Puree is one of the meal ideas from the new range of Meal Bag recipes. Grab a handy Inspire Meal Bag from Fresh Choice Nelson, or pick up all the ingredients you need in store and follow the recipe below. Preparation time – 20 minutes. Cooking time – At least 3 hours. Difficulty level – Medium. Mix 2 Tbsp of cornflour in a bag with the salt and pepper. Place the lamb shanks in the bag and shake until coated. Sear the lamb shanks on both sides in a hot pan to seal in the juices. Then place the lamb in a slow cooker on high. Deglaze the pan with the red wine (if using) and add that over the lamb. To the lamb add the finely diced onion and carrot and chopped rosemary. Then cover with the beef stock. Cook the lamb for around three hours. The meat should be soft and very tender. Once cooked, removed from the sauce and set aside. Place the sauce in a saucepan over a medium heat. Stir in 1 Tbsp of cornflour mixed with a little cold water, then bring to the boil until thickened, stirring all of the time. Peel and dice the parsnip and simmer until soft. Drain and add the cream and butter. Blend with a stick blender until smooth. Season well with salt. 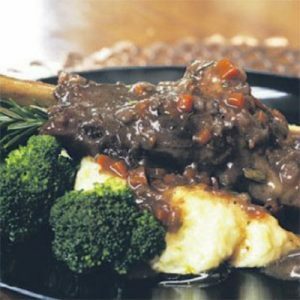 Serve the lamb shanks on the parsnip puree with the sauce and steamed broccoli. For more meal ideas, head into Fresh Choice Nelson and check out the Inspire Meal Bag range or order online. Seafood is often overlooked when supermarket shopping… I tend to cook with seafood when it has been given to me, or if I have decided to prepare a meal that calls for it. Fresh Choice Nelson has a marvellous seafood counter. With fresh fish delivered daily at competitive prices. There is also a range of seafood meal bags within the Inspire range. These are best ordered through the online option for your convenience. Salmon is one of my favourite fish. High in omega-3, rich, filling and super delicious. I find it works very well with Asian flavours, which I love. Today I’m sharing a recipe from one of the seafood meal bags. Pop into Fresh Choice, Nelson and shop for the ingredients you need, or conveniently order a bag for collection. Preparation time 10 minutes, cooking time 20 minutes. Place the washed potatoes in a saucepan with cold water, leave the skin on. Bring to the boil and simmer until they are cooked through (check them with a sharp knife to make sure that they are). Drain the potatoes, and when they are cool, peel the skin off with the back of a knife. Grate the potatoes and press them firmly into a ring mould to shape. This should make four rosti. Cook the rosti in a frying pan on a medium to high heat, until they are golden on both sides. Season well with salt and keep them warm until you are ready to serve. Simmer the cream and miso together for five minutes until thickened slightly. Again keep the mixture warm until you are ready to serve. Steam or lightly boil the edamame and baby broccoli. Pan fry the salmon, skin side down. Once the skin is crispy turn and cook through on the other side. Drizzle with the miso cream and sprinkle with sesame seeds. 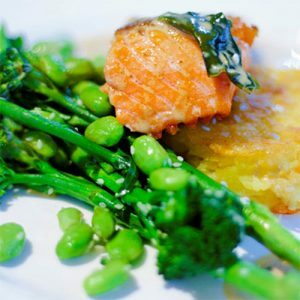 Serve with your rosti, edamame and baby broccoli.